After a long summer of baseball, there is very little time remaining in the 2018 MLB regular season. Each team has just about finished playing their 162 total games and the race for the playoffs is close to the finish line. Although the season isn’t over yet, a lot has happened, such as Boston experiencing a historic season and becoming the first team to clinch a playoff berth, the development of many tight divisional and wild-card races, and many surprise teams on the rise, including the Athletics, Braves, and Phillies. 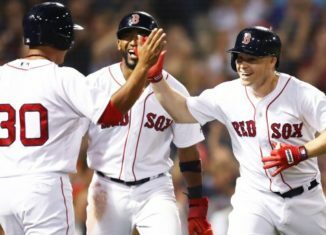 The Boston Red Sox are having their best regular season in 72 years, which is the last time they were 50 games over .500! Last season, the Athletics, Braves, and Phillies finished well under .500 and had awful years. Now, the Braves are leading the NL East with the Phillies right behind them in 2nd place. As for the Athletics, they are the surprise team of the year. They find themselves 32 games over .500 and only 3.0 games behind the defending champion Houston Astros in the AL West. Billy Beane clearly wants a Moneyball sequel. In the American League, the teams are pretty much set. The Red Sox and Yankees will both make it from the East, the Astros from the West, and Indians from the Central. The only team that could make a run for the Athletics’ wild card spot is the Mariners, but they are 5 games back and they don’t have enough pitching or hitting depth needed to go on a long run. The National League, however, is CROWDED. There are 4 teams within 7 games of the first place Wild Card holders, which is the Brewers. The other 4 teams are the Brewers, Rockies, Phillies, and Dodgers. The other division leaders besides the Braves are the Cubs and Diamondbacks. The NL is so tight that any of those teams can win the division and any of those teams cannot make the cut. The teams that will just miss the cut will be “playoff pretenders”. Some teams in this postseason race have a shot to be a contender for the pennant and a championship ring. Other teams in the race may not even make it past the first round. I consider the Oakland Athletics a true World Series contending team. I definitely wouldn’t have thought this at the beginning of the year, and certainly not at any point last season, but they have exceeded expectations and will be competing for a championship in the postseason. Assuming that everything stays the way it is now, the A’s will face the Yankees in a best-of-1 Wild Card playoff game, where the winner goes to Boston for the ALDS. Although the Yankees are one of the best teams in baseball and have been hot recently, Luis Severino has not been himself lately. Severino’s ERA has been above 3 for all of August, which is very far off from his usual dominance. He is probably going to be the Wild Card game starter, but if he doesn’t get back to his normal self, Aaron Boone might have to start someone like Tanaka, or even J.A. Happ against Oakland. The A’s also have a thrilling offense to watch, with Khris Davis leading all of baseball with over 40 home runs, and Matt Chapman having a much better hitting year than last year, aside from being the best defensive third baseman in the AL, and possibly in all of baseball. Chapman, Jed Lowrie, and Matt Olsen also have 20+ home runs this season. If they beat the Yankees in the Wild Card game, they play Boston, who they have beaten in both series they played this year. They’ve won 4 out of the 6 games when they played against the Sox, including a no-hitter pitched by Sean Manaea. The A’s certainly have what it takes to play for a World Series in October. The Phillies are currently 2 games behind the Brewers, who hold the last Wild Card spot. Philly has had such a bounce-back year after last year, and much of that has to do with the dominance of Cy Young candidate Aaron Nola, and closer Pat Neshek who has a 1.29 ERA. However, they do not have what it takes to catch the Braves in the division, or even the Brewers in the Wild Card race. The Phillies have major problems with pitching and offense. Nola is a star, but outside of him, the Phillies are very weak. They do have Jake Arrieta and he’s solid, but he isn’t the star pitcher he once was in 2015 with the Cubs when he won the Cy Young Award. It is very similar when it comes to the Phillies offense. They have Rhys Hoskins, and he’s a star, but besides him, they are extremely weak. Maikel Franco leads the team with a .268 batting average, which isn’t good for the best on the team. The Phillies are definitely a team on the rise in baseball, but this just isn’t the year for them.